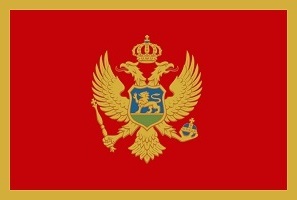 Montenegro, locally named Crna Gora and Црна Гора is a Parliamentary republic, found between Bosnia & Herzegovina, Serbia, Kosovo, Albania and the Adriatic Sea. It covers 13.812 square kilometres, and is the home of 678.931citizens. 74% are Christians and 19% Muslims. The local currency is Euro, worth 7,46 Danish Krone. The GDP is US$4.250 billion. Due to the mountains, the climate varieties a lot throughout the country. The coast is Mediterranean while the peaks are Alpine. Due to this, the biodiversity is high. The vascular flora of Montenegro has 3.250 species while the here are 18 amphibian, 38 reptiles and around 333 species of birds. Among the more interesting larger mammals are the Brown bear (Ursus arctos), Eurasian wolf (Canis lupus lupus), Balkan Chamois (Rupicapra rupicapra balcanica), Eurasian Beaver, Eurasian Lynx (Lynx lynx) (Castor fiber) and Boar (Sus scrofa). Among the more interesting plants are Draba bertiscea, Edraianthus wettsteinii, Edraianthus pulevicii, Viola nicolai, Campanula austroadriatica and Androsace komovensis. 31/5 2018. I enters from Bosnia & Herzegovina, and after having showed my passport, registering attest and green-card, I can enter. It is a scenic road right away, and fantastic sceneries. I follow the Piva Canyon, and the steep cast mountains and the blue river are crossed several times by elegant bridges. Here are so many flowers, even some I haven't seen before. Some mountainsides are rather flat, and small farms harvest hay on them. In one of the areas, the canyon opens up a bit, and narrow lakes mirrors the sky and mountains. The road sits on the steeper parts of the mountains, and some parts are more tunnels than open air. It take me a long time to drive the 35 kilometres through the canyon, and it continues to be pretty, when I reach the high plains. Here are a flowerbed that not only is impressing, the scent is so intense. Small houses have cows inside, it seems, and here are hardly any farming beside from hay. I stop so many times, to capture the landscapes and wild flowers, and I even find an orchid. Then I pass Niksic, a small and not interesting town at all. But they have an ATM, and I stock some Euros. Then I find the little road, leading out into the mountains again, this time towards Tare River. The mountains change into more barren, with lots of exposed, bright white limestone. Higher up, it turns more fertile again, and small herds of sheep grasses on tiny meadows. I find an adder, and corners it, so I can get a photos. Further up, the trees disappears, and some peaks are flat and covered in grass. Some have an astonishing amount of pink flowers, while others are covered in white clover and some yellow flowers. Some thunder clouds are pulling up, and I get some real heavy rain from time to time. I passes a few villages, with cow-huts, build from spare parts. Not the huge industrial ones I have seen elsewhere. Then I reach Tara River and Bridge. It was build in 1942 by local rocks, spanning 365 metres over the 150 deep gorge. Here are a few tourists and a lot of shops for them. The gorge is fantastic, and I head down along it. The walls reach 1300 metres in some parts, and the road is quite close to the river. A chamois is crossing the road in front of me, and I get a blurry picture. Due to the thunder and shadow in the gorge, it is hard to get good photos, but I sure enjoy this great drive. I pass Biogradska Gora National Park, but it is getting too late by now, but I might return in the morning. 1/6. It is a bit cold during the night, but this is above 1000 metres. I actually consider to release the huge duvet once again. But getting it back in the bag is a challenge, and I rather freeze a bit. I drive the 16 kilometres back, and have to stop several times due to the flower beds in the countryside. Some fields are pink, some white and some yellow. Some have a dash of blue and some are a mix. I reach Biogradska Gora National Park, and don't expect that much, as the fee is only €3. But am I in for a surprise! It is a huge park, and here are bears and wolves, but the centre piece is the lake. The lake is crystal clear, but the surface is covered in a thin layer of pollen. I park at it, and head for the shore. Here, I see at least eight Aesculapian Snake; Zamenis longissimus or Balkan Whip Snake; Hierophis gemonensis. Later, I discover there are two species. It seems like they sleep in some rocks during the night, and then spread out, when they are warmed up. I get them as they warm up. Later, I see more, but I hope I got pictures enough. It seems like they catch fish, as the lizards; Podarcis muralis are frisky quite close to them. Besides from the snakes, I see a lot of real huge Horse-leech; Haemopis sanguisugain, in and above the water. A whole bunch is fighting over a Roman Snail; Helix pomatia, which by the way grow real large here. I see quite some, as a walk the trail. A trail is leading the entire way around the large lake, and I figure I start on it, and return when I get bored. The surface of the lake is around 1110 metres height, and it is still kind of late spring here. That means quite some flowers, despite it is in the forest. The park have 26 different habitats and a total number of plant species on 2000. And the trees are huge! Some are more than 300 or even 400 years old, and here are many species. Old ones are left to rot on sight, and that create a rich insectlife and thereby birdlife. Before long, I see a Common Toad; Bufo bufo on a rock in the water. Then a large millipedes, some Armadillidium sp. It is around eight centimetres and red-brownish. I make a lot of photos of the lake - all looking pretty much alike. Then I stumble over another millipedes; Polydesmus collaris. It is in the shadows, and I like to let the animals be - which means I only get blurry photos. I really like when I can get a good picture, and leave the animal right where I found it. As the track continues into the forest, along the lake, several creeks meet the lake. A long path is boardwalk, crossing soft terrain and crystal clear creeks. I try to make photos of the giant trees, some reaching 40 metres, but as always; trees in a forest is the hardest to capture ever! Before I even consider to turn around, I meet the halfway sign. Here are some giant slugs, black with a stripe on the back; Black keel back; Limax cinereoniger - unless it is something else. I almost make it back to the car, before I meet anyone. Then I pass a small group of Frenchmen. I great the first two with "Good morning", but despite the trail is only 50 centimetres vide, and I step aside, they don't even look at me. I try "Bonjour" with the rest, but now, they only look at me. Not a single nod or greeting at all! When I get to role the world, less Frenchmen will be needed! The parking lot is now filled with cars and busses, and I decide; it is time to leave. I choose a huge detour, 150 kilometres through the forests and mountains, but I have no rush, and so far, Montenegro have been so great! The first part is by a good road, passing small farms and villages. Here are hardly any farmland, only hay and small vegetable gardens. Then the central mountains starts, and most houses disappears. I pass what might be a skiing town, and then it is pure nature. Well, here must be some farms, as there are a few cows on the road. In the highest part, the road turn real narrow, but the sealing is not bad at all. I just have to watch out for fallen rocks! Way down in the valleys, I can see some scatted settlements, and I pass a single goat next to the road. It seems like the entire area is cast mountains, some nicely folded. It start to rain, and the light disappears, but despite I can't make photos, it is still a great drive. The fare mountains have sun AND snow. I am not sure how height I get, but to judge from the flora, it must be at least 1500 metres. I drive around 100 kilometres without meeting a single car. Here are people around, but not on the road, which by the way, is named R18. I finally reach a bigger road: two lanes, and here are a bit more lively. As a new thunderstorm approaches, I find a restaurant with a mean chocolate cake and internet. When it pours down, some bikers are passing, and I feel lucky. I pass some open areas as I head on, and do some extensive walking. The number of flowering plants are enormous, so are the number of each. Eventually I get back to Niksic, and set the GPS for Kolasin town, then Ostrog Monastery. It is way up a mountain side, and to judge from the amount of stalls along the road, it is popular. If I should have guess from the road, I would have said; abandon! I have to do several stops on the way up, as the views are great. Flowering bushes, figs with fruits, the villages deep down the valley and to my big delight; a Scheltopusik or Glass Lizard; Pseudopus apodus. It is kind of a giant lizard without legs. I had some, many years ago: real lovely animals. Unfortunately, I get to scare it, before I get a good photo. The monastery is a pilgrim sight, and some appears to have sleeps here. I have visited several "cave" monasteries which only had one tiny cave, and huge recent buildings in front. This one have mainly modern buildings, but they are almost within the mountain. Several small rooms, and a big one: With the shop. The Catholics sure know how to make money! The old cave can be visited, but not photographed. It seems like a corps is kept in the back. Another cave is for the candles, and it is hot and black. I have seen enough, and start the decent. On the way down, I meet a heard of sheep with herdsmen and dog. Then I spot a Hermann's tortoise; Testudo hermanni, and get a few photos. Then I drive through Niksic once again, and into the lowlands. On the way, I pass an area with snow! OK, it might be hails, but it look odd. Then there are rocks on the road again, and some poor fellow have hit them. They are quite bigger than his car! Besides from that, it is a great drive, and I end up at the seaside. Well, it is way deep in a fjord, but the temperature feels so much better. I find some fresh letish, then the camp, and test my mosquitoes. They work! More than 400 pictures and a lot of experiences take its time, and it get too late - again. But that is not meant as a complaint at all! So far, Montenegro have been such a positive experience. So much nature, so clean and friendly and easy to access. It is now time to head into the Diary 2 with the south-eastern Montenegro.